Obituary – Wetzel, Nicholas Maxon « Perry High School Alumni Association, Inc. Basket Ball ’22, ’23; Tennis ’20, ’21; Freshman Play ’19; Peroma ’23. Nicholas Maxon Wetzel, 64, a lifelong resident of Perry, died at 9:30 p.m. Friday in Perry Memorial hospital, where he had been a patient since Jan. 14. Services will be at 2 p.m. Monday in the First Christian church, with Rev. James Lambert, pastor, officiating. Burial will be in Grace Hill cemetery under direction of Parker funeral home. 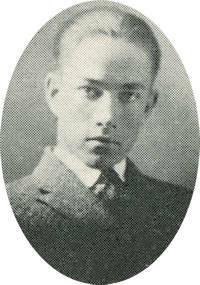 Wetzel, a resident of 209 Elm street, was born Nov. 28, 1904, in Perry, to Thomas Maxon and Anna Dorcus (Huffington) Wetzel. He was married in 1943 in Enid to the former Marie Eby Wolfe, who survives. Wetzel had been a florist and landscaper in Perry for 30 years. He was a member of the Christian church and the Independent Order of Odd Fellows. In addition to his wife of the home, survivors include two sisters, Mrs. Nell Coldiron, Southgate, Calif.; and Mrs. Luticia Cathey, Roswell, N.M.; and a brother Leo Wetzel, Morrison.